Allocator - Values allocator, all allocators needed by the container are created from it. R-tree may store Values of any type as long as passed function objects know how to interpret those Values, that is extract an Indexable that the R-tree can handle and compare Values. The Indexable is a type adapted to Point, Box or Segment concept. The examples of rtrees storing Values translatable to various Indexables are presented below. By default function objects index::indexable<Value> and index::equal_to<Value> are defined for some typically used Value types which may be stored without defining any additional classes. By default the rtree may store pure Indexables, pairs and tuples. In the case of those two collection types, the Indexable must be the first stored type. By default boost::tuple<...> is supported on all compilers. If the compiler supports C++11 tuples and variadic templates then std::tuple<...> may be used "out of the box" as well. The predefined index::indexable<Value> returns const reference to the Indexable stored in the Value. The translation is done quite frequently inside the container - each time the rtree needs it. 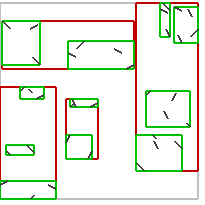 for Point, Box and Segment - compares Values with geometry::equals(). for std::pair<...> - compares both components of the Value. The first value stored in the pair is compared before the second one. If the value stored in the pair is a Geometry, geometry::equals() is used. For other types it uses operator==(). for tuple<...> - compares all components of the Value. If the component is a Geometry, geometry::equals() function is used. For other types it uses operator==(). Values may be inserted to the R-tree in many various ways. Final internal structure of the R-tree depends on algorithms used in the insertion process and parameters. The most important is nodes' balancing algorithm. Currently, three well-known types of R-trees may be created. Balancing algorithm parameters may be passed to the R-tree in run-time. To use run-time versions of the R-tree one may pass parameters which names start with dynamic_. The obvious drawback is a slightly slower R-tree. Non-default R-tree parameters are described in the reference. 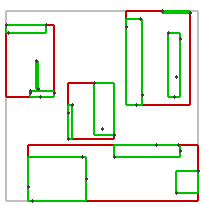 The R-tree is copyable and movable container. Move semantics is implemented using Boost.Move library so it's possible to move the container on a compilers without rvalue references support. The following code creates an R-tree using quadratic balancing algorithm. To insert or remove a `Value' by method call one may use the following code. To insert or remove a `Value' by function call one may use the following code. Typically you will perform those operations in a loop in order to e.g. insert some number of Values corresponding to geometrical objects (e.g. Polygons) stored in another container. 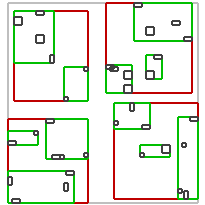 The R-tree allows creation, inserting and removing of Values from a range. The range may be passed as [first, last) Iterators pair or as a Range adapted to one of the Boost.Range Concepts. Furthermore, it's possible to pass a Range adapted by one of the Boost.Range adaptors into the rtree (more complete example can be found in the Examples section). // create Rtree containing `std::pair<Box, int>` from a container of Boxes on the fly. There are functions like std::copy(), or R-tree's queries that copy values to an output iterator. In order to insert values to a container in this kind of function insert iterators may be used. Geometry.Index provide its own bgi::insert_iterator<Container> which is generated by bgi::inserter() function.